Kai Schober has posted the following to UOHerald.com in regards to new patches that were rolled out this afternoon. We delivered a new client on the patcher today at 2 pm EDT – Classic Client 7.0.13.3 and Enhanced Client 4.0.13.3. The Patch is a preperation for the upcoming Easter Events. The events will start on April 24 and lasts for two weeks till May 8th. Please enjoy and have a safe Easter. 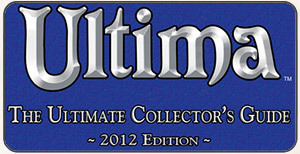 Included in these patches are some interesting tidbits relating to the future of UO. SKIP THE TEXT BELOW IF YOU DO NOT WANT TO BE SPOILED!! It looks like the vendor bazaar and pet brokers will shape up to be another gold sink. It also looks like there will be a commodity system of sorts added, which is very interesting. * Possibly some text regarding cursed items for the upcoming PvP Arena. Removed Text: The next available Counselor/Game Master will respond as soon as possible. Please check your Journal for messages every few minutes. UO Journal note: when I made a GM call tonight for a problem I ran into, I received this which is probably a result of that removal (see the image on the right) . I believe the removal was an accident, and I was still able to speak with a GM. – Your skill in this weapon cannot improve any further by simply practicing with a dummy. – Your skill in parry cannot improve any further by simply practicing with a dummy. – The dummy’s sword swings at you! Defend yourself! – You need a training dummy (east) deed to make that. – You need a platemail tunic to craft that (human male, non-magic). – You need a close helmet to craft that (human, non-magic). – You need a metal sheild to craft that (human, non-magic). – You need a broadsword to craft that (human, non-magic). 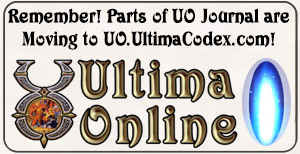 UO Journal note: It looks like the advanced training dummies will require several items to craft. They will be pretty cool I think. Simple change in text in regards to using Bags of Sending. To: this item will not function while being traded. UO Journal note: Maybe a reference to the upcoming Spring Cleaning event. From: You must use a seed on a bowl of dirt! To: You must use a seed on some prepared soil! Select a player made liquor to label. You carefully remove the label from the liquor. The liquor was not labeled. The selected item is not accessible to label. Your Pet Broker charges a weekly fee of 5% of the total sales price of all pets in its inventory. Fees are effective immediately upon placing pets up for sale. Fees are recalculated immediately when pet prices are changed. Once a pet is sold or removed from inventory, no more fees are charged for that pet. For example, if a pet is priced at 10,000gp, the weekly fee is 500gp. If the pet is sold 24 hours after being placed up for sale, the total fee paid for that pet will be 71gp. Fees are charged incrementally over time. In addition, the Pet Broker charges a 5% commission on each sale. This commission is in addition to the weekly fee. It is possible for your account balance with your Pet Broker to become negative due to fees charged. To prevent this, you must deposit sufficient funds in advance to cover fees. If your pet broker does not have sufficient funds to cover fees charged, you will be required to pay the back fees before you may alter pet pricing or adjust the shop inventory. Click the button next to a pet to select it. Enter the new price you wish to charge into the box below the pet list, then click the “SET PRICE” button. That pet is not in the shop inventory. You cannot add more pets to this animal broker’s inventory at this time, because the shop inventory is full. Click the button next to a pet to remove the pet from the animal broker’s inventory and transfer it to the stables. Failed to transfer the selected pet to your stables. Either the pet is no longer in the broker’s inventory, or you do not have any available stable slots. Your pet (TYPE) named (NAME) has been transferred to the stables. Commodity brokers will buy and/or sell commodity items for you. The broker charges a 5% commission on all transactions. Additionally, the broker charges a 5% weekly fee on the total sale price of all its sellable inventory. The weekly fees are charged incrementally over time. The broker charges no fees for outstanding offers to buy commodities. Your commodity broker has an account balance, which you must fund from your bank box. These funds will be used to pay weekly fees on inventory for sale, and will be used to buy commodities from others. If the broker has no funds available, it cannot purchase commodities for you. Proceeds from each transaction go into this account. You may deposit into it and withdraw from it at any time. To enter an item into your broker’s inventory, you must have a sample of it, either as an item or a filled commodity deed. Click “Add to Inventory” and target the item or deed. It will be stored in the broker (and can be retrieved later if desired). Once your broker has stored an item for the first time, it has learned about that item and will be able to buy and/or sell that item for you. After you have stocked your broker with funds and commodities, you may then set prices and trade limits. Trade limits instruct your broker to only buy a commodity when its stock level is below the limit you set, or to only sell a commodity when its stock level is above the limit you set. Your broker may buy and sell the same commodity at the same time, so long as its sale price is higher than its buy price. When your broker buys commodities, the seller receives the full price you offer from your broker’s account balance, and then the broker deducts its 5% commission on top. When your broker sells commodities, the broker receives the full price from the buyer, then deducts its 5% commission and adds the remainder to the account balance. Brokers cannot buy commodities when they do not have sufficient funds for the trade (i.e. 105% of the value of the trade). It is possible for your broker’s account balance to become negative due to fees charged. If this happens, the broker will continue to sell commodities, and any proceeds will cover the negative account balance first. However, a broker with a negative account balance will not be able to buy commodities, nor will it allow you access to its inventory, until you have deposited funds to cover the negative account balance. All in all, a lot of very interesting things coming out in the next booster pack or major publish. These are things that are going to be adding depth to existing systems such as gardening and taming or expanding the systems available. Some have argued against pet vendors as removing some of the personal interaction within UO, and to an extent they are right, however because the community is smaller than in times past, it can be difficult for players to find other players that either have what they need or need what they have when it comes to taming. I’m not sure about the commodity vendors. I have an idea of where they are going with it. It’s awesome to go to see this site and reading the views of all friends regarding this piece of writing, while I am also keen of getting familiarity.